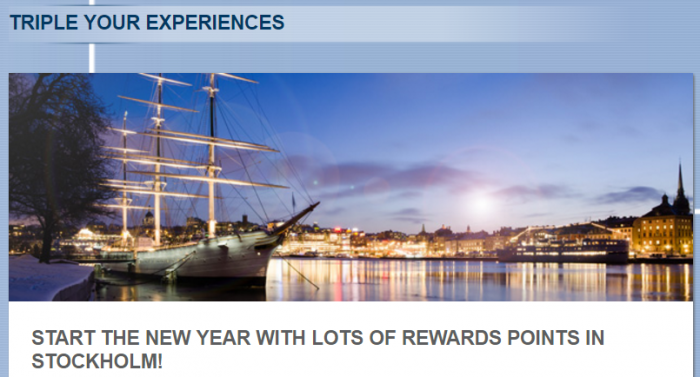 Le Club AccorHotels has launched a triple points promotion for stays in Stockholm consumed between January 1 – March 31, 2017, that are booked January 1 – 22. Supposedly this offer includes also breakfast so booking some specific rate could be required. This cannot be checked as of now because the booking window opens on January 1. Accor lost most of its hotels in Sweden back in 2015 (read more here) when they were reflagged. There are only three hotels left in Stockholm of which two are are participating to this promotion. 1. General Le Club AccorHotels terms and conditions apply to the Triple your experience offer and you must be a Le Club AccorHotels member to benefit from it. 2. This offer entitles Le Club AccorHotels members, regardless of their membership status, to earn bonus of triple Rewards points OR multiply by 3 their Rewards points for a stay in one of the participating hotels in the Le Club AccorHotels Loyalty program. This bonus of Rewards points is offered in addition to the Rewards points and Status points that are usually earned by the Le Club AccorHotels member for each eligible stay done in application to the Le Club Accorhotels General Conditions of Use. 4. The stay must be a minimum of1 night. 5. Any consecutive stays (check-out and check-in same day) in the same hotel, will be considered as a single stay. This single stay will be eligible once on the Triple your experiences offer. 9. The Le Club AccorHotels Rewards points bonus is credited within 10 days following the end of his/her stay. 13. Please specify the reference 48570 in all your communications with AccorHotels call centers or customers care services related to this offer. You must register for the Triple you experiences offer before proceeding to the booking, to be eligible for the offer.